Will things go boom on the Scandal Season 3 Episode 18? 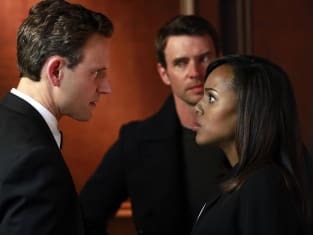 As Jeff Perry (Cyrus) told us earlier this week, tonight's explosive finale easily rivals last season's concluding shocker of Olivia Pope coming face-to-face with her father. Last week, of course, Cyrus was aware of a bomb but kept his mouth shut in hopes that Presidential candidate/rival Sally Langston might be extinguished, thus solving a world of problems that have been brewing all season. How will that storyline play out this evening? TV Fanatic: Is it safe to say that everything is simmering just under the surface for Cyrus and maybe we’ll see it explode in the finale? 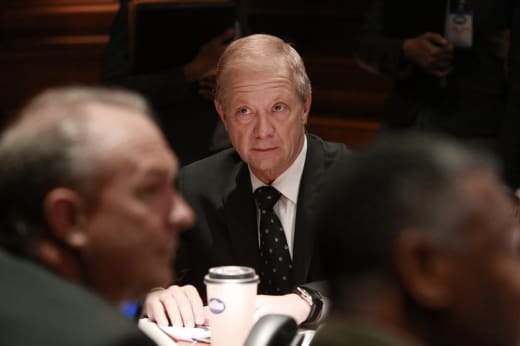 Jeff Perry: Yeah, we will. The chickens will really come home to roost. The finale goes to three days before the election to the early evening of election day so we’re going to find out what happens to Sally’s lead, we’ve got a ticking bomb…the fun of watching the finale is where is this going to go? And what’s going to happen with this bomb? And did Cyrus really do what I think he just did? It’s scary! TVF: Would you say that Cyrus has a conscience or does his bigger picture of the Presidency and his place in it outweigh that? JP: There are ways in which the ideological justification is similar to what we’ve heard out of Jake Ballard and B613…it does come back to [Cyrus’s] core believe that Fitz can be a great President. It’s kind of like this man can get a country in foreign policy and domestic policy to define ourselves less by our differences and more what is common about us, which is very much a Barack Obama message for both terms. I think Cyrus really believes that Fitz can shine if we get past all the problems, problems which were actually self-inflicted. TV: Do you feel like you’ve been challenged differently this season? Cyrus has definitely been through a lot! JP: Cyrus’s comfort zone is crisis management. As much as he can give himself to Fitz all the way to heart attacks and trying to temp down different levels of crisis, it is his comfort zone. What happened this season were wounds that were really self-inflicted. He had grave miscalculations about things going all the way back to the beginning of the series of trying to keep Sally wrangled and not to have her do exactly what she does, which is break off. In real American politics, there’s only been one time apparently where a sitting Vice President runs against their boss. That was great of Shonda to pull out that little thread that is both constitutionally possible and has happened once. And that’s what Cyrus was trying to avoid but because of his own DNA and not listening to Mellie’s warnings, a tremendous miscalculation of using his husband as part of a plot in order to leverage Sally and entrap Sally’s husband and hopefully use the blackmail of pictures, photos, and setting him up with what looks like consensual adultery between his husband and Sally’s husband. And it was absolutely useless as leverage. This and never predicting that Sally’s going to go haywire and commit murder. It was a huge miscalculation of Cyrus in covering up the murder and hoping to cement Sally’s loyalty and, instead, it just makes her more cuckoo. And, at the same time, he loses his husband, drives a wedge into their marriage in this plot to get rid of Sally…his husband is a casualty and it looks like the election could be a casualty. TVF: We hear the phrase ‘game changer’ a lot. Would you say this finale is a game changer? JP: The writers are really relentless and fearless and going to where ….they’re taking authentic steps in the story. If we go here, here and here, then there are many possibilities of which direction we can go but I think they’re always asking themselves if it’s authentic to where we’ve been. If you want the audience to believe that this has authenticity as to where the story is going. And they are fearless with how far they can go. In writers’ terms, just how much story they can burn. This is another example of that. It will rival last year’s finale with Olivia being forced into a limo to get away from the press, seeing Rowan and saying ‘Dad.’ This one, I think, will be right up there with that. TVF: When did you find out that James was going to be a casualty this season? JP: We had a couple weeks notice before the world. We probably had 2-3 weeks before it aired so we had some time to lick our wounds and really reflect on how beautiful this path has been. Three and a half years of Shonda giving a couple of actors who love these characters and who love being in this show this gorgeous, complicated range of emotions and events over that time and a lot of texture to a relationship. Dan [Bucatinsky] and I have been buddies for over 15 years or something and it was crazy, precious territory. We loved being able to work together, loved being able to do this work so there was a mourning period. Actors always know they’re servants to the story. Sometimes there are plane crashes, car crashes and mayhem but it still really hits you especially when it happens to one of your own. TVF: It’s been nice to see this journey of Cyrus and James because instead of thinking of them as a gay couple, I think viewers just started thinking of them as a couple. The diversity of the Greys Anatomy cast, it wasn’t the first or last time on television, but it was very tangible and it proved to be kind of profound…we’re starting to go ‘I don’t care about your sexual preference, I don’t care about your religious preference, I don’t care about your political preference.’ It is not all that defines you. TVF: Would you like to see Cyrus dating in the new season or is he going to be taking care of his poor heart for awhile? JP: What I’ve come to trust is that Shonda will explore multiple things at once. So quickly, and honestly, we’re seeing some of Cyrus’s reaction to the tragedy of losing James. We’re seeing a certain amount of denial, we’re seeing grief, we’re seeing anger, we’re starting to see revenge poke its head up [and] Shonda has made room for all these reactions, the multiplicity of things so I assume that’s going to keep going. The first thing that comes is that [Cyrus] practically bought a child like he’d buy a sports car for his husband/lover. Cyrus has to figure out how to be a human and a father pretty quick here so that’s the first thing that comes to my imagination. He has a little human being to deal with! Scandal Season 3 airs Thursdays at 10/9c on ABC. I do not like him, but Olivia, I do love you, and I want you to have everything, everything you deserve. So when I say I wish I could help, I do wish I could help. I wish I could help you. Olivia: We're gonna lose the election on Tuesday. Cyrus: Let's be honest. We lost the election today. Permalink: Let's be honest. We lost the election today.